Wild dogs often kill animals they do not intend to eat, and often kill more animals then they need to for food alone. Recognising the type of injuries and damage found on alive or dead sheep will help you identify wild dog activity and to prepare a dog management plan. Dogs prefer to chase animals that are fleeing from the group. Flocking animals makes it more difficult for the dog to concentrate on a single individual in a group. Whether a wild dog is hungry or not, sheep fleeing behaviour instinctively triggers a response from the dog to chase and attack until the sheep is overcome, or too exhausted to defend itself. The following information can help recognise activity when finding dead or injured sheep. Depending on the type of ground and the amount of time elapsed since the attack, tracks may be found indicating a struggle. Both the wild dog and its prey often leave deep prints with toes spread out. Freshly broken vegetation, often holding tufts of wool, is sometimes found at the site of the attack. Pieces of wool with patches of torn skin attached as well as blood trails are good indicators of wild dog predation. Often however, scavengers obscure the tracks and other signs. The presence of dog tracks at a carcass does not necessarily mean predation was the cause of death, particularly if the tracks are more recent than that of the carcass. It is important to note the position of the carcass; sheep dying from natural causes usually die in shady places, sometimes near water. A carcass found out in the open away from available shade can point towards predation. In the same way, the age and condition of the sheep can give a clue to predation; often young and apparently healthy sheep are found dead, leading to suspicion of predator attacks. Wild dogs generally kill by bites to the throat. This damages the trachea and the major blood vessels of the neck. Blood on the throat is therefore good evidence of wild dog predation. Blood is often found at the mouth and nose, although care should be taken to distinguish blood here from other body fluids which drain from a decomposing carcass. Ewe killed by wild dogs, note the blood on the ground but little external damage is apparent. Wild dogs often attack sheep from behind as they run away, resulting in injury to the hind legs. Inexperienced wild dogs, or those attacking 'for fun', frequently inflict considerable damage to the hind end of the sheep. This often leads to its death. In these cases, blood is often found caked on the hind legs. The pattern made by blood flowing down the legs while the sheep was still upright can be clearly distinguished from blood or fluids which may flow as a result of feeding or decomposition or animals feeding on a carcass. Sheep attacked at hind end. Note pattern of blood flow which took place when sheep was standing. Wild dogs' saliva, even when dry, can sometimes be seen on the wool of attacked sheep. Simple skinning of the throat and hind legs is often sufficient to reveal hidden damage. Tooth punctures in the hide, subcutaneous haemorrhage, bruising and tissue damage will indicate dog involvement. Skinning revealing tooth punctures, haemorrhage and tissue damage, clearly distinguishable from undamaged portions of the carcass. External signs of tissue damage due to feeding or scavenging activities can be readily confirmed in a fresh carcass by such simple dissection. Tissue damage caused after death will show no haemorrhage; this only occurs if the animal is bitten while still alive. Decomposition and/or scavenger damage can mask the cause of death in older carcasses. Often however, blood-stained wool still remains (especially on the lower legs which often dry out intact). Again care must be taken to ensure that decomposition fluids are not mistaken for blood. Depending on the carcasses age, dissection is often warranted as bruised tissue can still be distinguished from undamaged tissue in a decomposing carcass. Provided that the skin is still intact, damage can often be revealed by simply pulling out the wool. Puncture wounds in the throat may be uncovered in this manner. Tooth punctures and bruising revealed in a decomposing carcass by pulling out neck wool. There are no predators in Australia apart from wild (or domestic) dogs that are large enough to inflict the sort of damage to adult sheep just described. The situation is often more complex in the case of sheep younger than about six months of age. 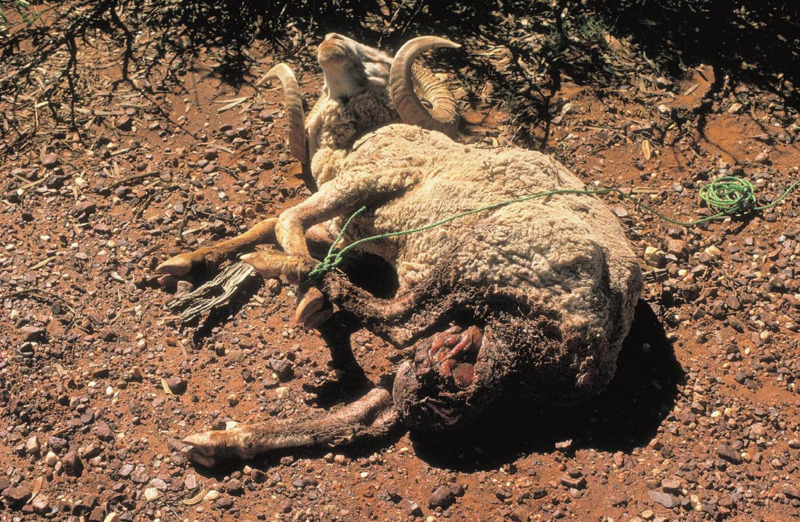 Many young lambs die from causes other than predation, and predators are often suspected as a result of scavenging on already dead or moribund lambs. To verify predation, dissection must show haemorrhage and bruising as described for adult sheep. Other methods can be used to determine whether the lamb was healthy and likely to have survived in the absence of predation. A further complicating factor in relation to lambs is that predators other than wild dogs could be involved. While the incidence of fox attacks on healthy lambs has been found to be lower than was generally believed, there are occasions when it does occur. Apart from other signs (tracks, scats, damage to adult sheep in the area) it can be difficult to distinguish between fox and wild dog predation on lambs. The size of bites and puncture marks probably provide the most reliable guide. Although foxes often tend to feed from the heads of lambs, there is variation in the behaviour of both individual foxes and wild dogs which sometimes make definite predator identification difficult. 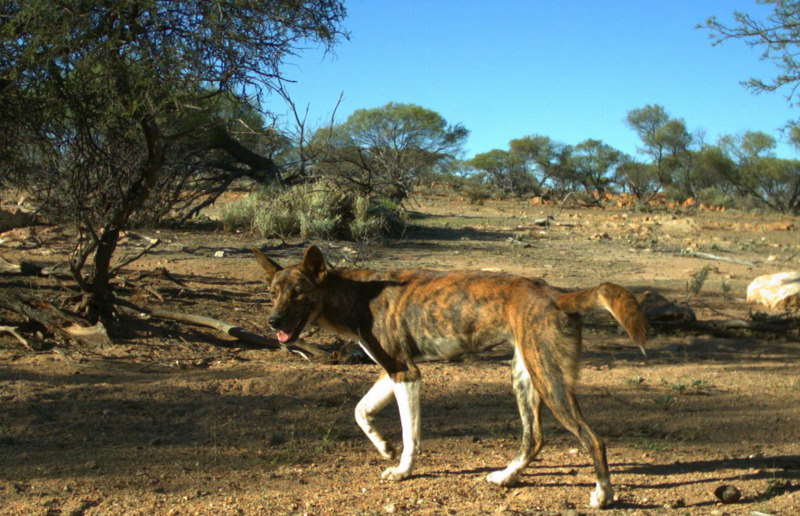 Few sheep recover from severe wild dog-inflicted injuries; blood loss, shock, infection and inhibited movement are probably the most important factors in later death. Injured lambs are rarely found, as they seldom survive a wild dog attack. Injured sheep are sometimes found in areas where wild dogs are active. Sheep that have been bitten often drift towards the rear of a mob and can frequently be seen hobbling behind. They sometimes remain close to water, though if the injuries are bad enough they may not be able to move at all. Sheep showing signs of injury should be examined for bite marks and blood, particularly on the hind parts. As mentioned above, wild dogs often bite the hindquarters, causing easily identified injuries. Rams use their horns to deter wild dogs from frontal attacks, they therefore suffer more rear attacks than other sheep. A torn scrotum or sometimes even complete castration may be found. This sheep was severely injured by wild dog attack and would not have survived. Damage to the head or neck area of sheep usually results in their quick death, so almost invariably animals found with these injuries are already dead. Any doubts about the cause of bad injuries can be easily solved by post mortem examination. Occasionally sheep bearing scars from wild dog attacks are discovered, particularly at shearing. Care should be taken to distinguish bite marks and tears from shearing or wire scars, though wild dog damage is usually easily recognised. Scars from a previous wild dog attack on the scrotum of a ram.